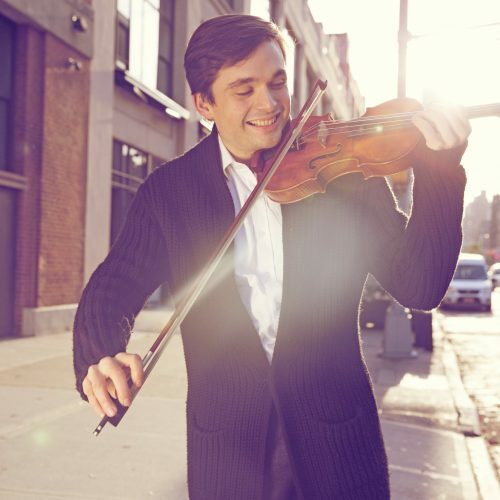 Spanish violinist Francisco Fullana has received international praise as a “rising star” (BBC Music Magazine), an “amazing talent” (maestro Gustavo Dudamel) and “a paragon of delicacy” (San Francisco’s Classical Voice). His 2016 recital debut at Carnegie Hall was noted for his “joy and playfulness in collaboration; it was perfection” (New York Classical Review). A native of the Spanish Balearic island of Mallorca, Fullana is making a name for himself as both a performer and as a leader of innovative educational institutions. His active performing schedule has included a Mendelssohn Violin Concerto with the Bayerische Philharmonie, under the baton of the late Sir Colin Davis, the Sibelius Concerto with the Münchner Rundfunkorchester, and a Brahms Concerto led by Señor Dudamel at Venezuela’s Simon Bolivar Hall. He has soloed with the Vancouver, Pacific, Alabama, Maryland, Madrid and Hof Symphonies and the Spanish Radio Television Orchestra, while collaborating with such noted conductors as Davis, Dudamel, and also Alondra de la Parra, Christoph Poppen, Jeannette Sorrell, and Josh Weilerstein. Francisco has taken part in the Marlboro Music Festival and “Musicians from Marlboro” tours. He has joined in prominent chamber series including the Music@Menlo, the Da Camera Society, Perlman Music Program, and Yellow Barn, alongside members of the Guarneri, Juilliard, Pacifica, Takacs and Cleveland Quartets, while performing alongside such renowned artists as Viviane Hagner, Nobuko Imai, Charles Neidich and Mitsuko Uchida, among many others. The coming year will find Fullana in debuts as a soloist with the Castilla y Leon, Boca del Rio and Las Cruces Symphony Orchestras, Buffalo Philharmonic Orchestra and the Saint Paul Chamber Orchestra and returns with Alabama, Balearic Islands, Dana Point, Extremadura and Xalapa Symphonies, among the concerto performances in U.S., Europe and Asia. Among the many chamber music engagements on his upcoming schedule, he has been invited to join the prestigious roster of Lincoln Center’s Chamber Music Society Two, starting in 2018. Orchid Classics will release this upcoming March Francisco Fullana’s new recording Through The Lens of Time, which includes Max Richter’s “Four Seasons Recomposed,” with the City of Birmingham Symphony Orchestra conducted by Carlos Izcaray. The ambitious project carries forward from its modern reconsideration of Vivaldi’s beloved classic with a series of contemporary solo works that also shine a new light on the baroque music tradition. Fullana’s ongoing collaboration with Argentinian bandoneonist J.P. Jofre will culminate with the 2018 premiere of Jofre’s Double Concerto for Bandoneon and Violin, a work commissioned by the Balearic Islands Symphony, San Antonio Chamber Orchestra and New York City’s Metropolis Ensemble. Fullana was honored in 2015 with the Pro Musicis International Award, the same year also finding him awarded First Prize in the Munetsugu Angel Violin Competition in Japan, along with all four special prizes including the Audience and Orchestra awards. He won First Prize in the 2014 Johannes Brahms International Violin Competition, in Austria, while his other awards include First Prizes at the Julio Cardona International Violin Competition and the Pablo Sarasate Competition. Francisco has also become a committed innovator, leading new institutions of musical education for young people. He is a co-founder of San Antonio’s Classical Music Summer Institute, where he currently serves as Chamber Music Director. He also created the Fortissimo Youth Initiative, a series of baroque and classical music seminars and performances with youth orchestras, which aims to explore and deepen young musicians’ understanding of 18th century music. The seminars are deeply immersive, thrusting youngsters into the sonic world of a single composer, while inspiring them to channel their overwhelming energy in the service of vibrant older styles of musical expression. The results can be galvanic, and Fullana continues to build on these educational models. He currently performs on the 1735 “Mary Portman” ex-Kreisler Guarneri del Gesù violin, kindly on loan from Clement and Karen Arrison through the Stradivari Society of Chicago.